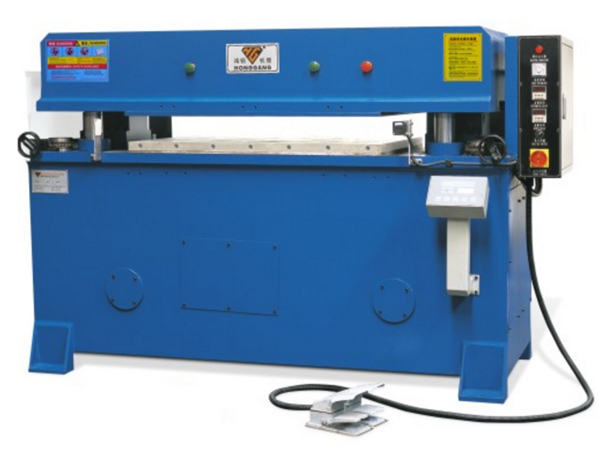 This 25tons die cutting machine usually used for die cutting non-metal materials,such as plastic film,foam,rubber,cases,purse,gloves,blister card and so on. 1.Auto-balance structure of double-cylinder, four-column and self-balance connecting rod, makes sure equal cutting pressure in any working area. 2.Slow down when the cutting die touches material, to confirm the precision between upper and bottom for thick materials. 3.Stroke adjustment device, makes stroke simple and correct to adjust with cutting die, cutting board and materials. 4.Central automatic lubrication system, increases machine durability, prolong the working time. 5.Suitable for single-layer or multi-layer sheet or roll materials.